Hundreds were dressed up in their best attire for the Johnston Press South Business Awards in Brighton last night (September 30). The annual award ceremony, held this year at The Grand Hotel, in Kings Road, Brighton, celebrates the best in business within the Sussex Coast. Now in its sixth year, the awards ceremony, organised by JP South Events, was presented by BBC One Show presenter, Nick Wallis, who said it was ‘fantastic how much support the awards get and shows just how important it is to support the business community in the area, even when times are tough’. The evening kicked off at 6.30pm with a drinks reception and three course meal. The 19 awards were handed out from 9.30pm. The first award of the night was for customer service and went to Fin and Farm, who deliver fresh Sussex produce to home and commercial kitchens in Brighton, Hove and Lewes. Mr Wallis said: “Fin and Farm bring together farmers and those who love good food, making it fresh, accessible and easy. The category sponsor was Richard John Hair and Beauty Salon and was presented by Richard John. The best start-up business award went to The Nature Shop. Mr Wallis said of the company: “The owners are passionate about their products. The category sponsor was MASS Productions Events Ltd. Kieran Stanley and Roman Ladd from the company presented the award. The innovation award, which was sponsored by the Nigel Greaves Gallery and presented by Nigel Greaves, went to ETI, the largest manufacturer of digital thermometers in the UK, based in Worthing. Mr Wallis said: “The development of new products is just part of the company’s continual investment in innovation, which it believes is essential in maintaining commercial advantage. The winner of the Small Business of the Year was Luv Carpets. Mr Wallis said: “Judges said it was good to see two young men grow a small business with such passion and drive for local, national and international market. The award, open to firms with up to nine employees, was presented by Stefan Buss from Storm. The Green Business award went to The Big Lemon, presented by Mike Walker from Country Clean. Mr Wallis said: “The Big Lemon shows real commitment to the environment and green innovations across its whole company approach. The Training and Development award, presented by Denise Greaves from etc Magazine, went to Richard John Academy, a hair salon which has 14 apprentices. The Hospitality, Tourism and Leisure award went to the Hilton London Gatwick. Simon Wallace presented the award sponsored by Gusto. The winner of the medium sized business award was Bexhill Electrical. Mr Wallis said: “Bexhill Electrical is a family business that was set up in 2001. The award, for businesses with between 10 and 49 employees, was presented by Zelda Reeves, Divisional Events & Sponsorship Co-ordinator for JP South Events. The Outstanding Contribution To The Community award went to Auntie Vals Community Interest Kitchen. Zelda Reeves collected the award of their behalf, presented by Gerry Hussein from Best of Brighton & Hove. The Employer of the Year award went to Dynamite Recruitment. It was presented by Alex Jenkins, Social Media Editor for Sussex newspapers. Mr Wallis said: “Dynamite Recruitment won due to its testimonials and the family feel and approach as an employer. The winner of the Best Employee or Best Team category was the Marriott Hotel. Mr Wallis said: “The hotel is a real example of team work. The award was presented by Paul Windsor, from P A Windsor. The Place to Eat Award, presented by Jane from Special Creations, went to Indian Summer. The Young Achiever award went to Rachel Blair from WCHP. The Manufacturing And Construction award, presented by Simon Wallace from Gusto Wines, went to Supersigns. “Judges said Supersigns has good repeat business and encouraging three year business objectives,” Mr Wallis said. The Large Business Of The Year award, presented by Mark Waldron JP South Editorial Director, was awarded to 1st Central. “This insurance management company launched in 2008 and now has more than 325,000 customers and 624 employees,” said Mr Wallis. The Retailer of the Year award went to Creatiques Bridal Boutique. The award was presented by David Wilde from Regis Removals. The winner of the Business Personality award was Clive Collins from Catsfield Christmas Tree Farm. “Clive is the founder of Catsfield Christmas Tree Farm which has been supplying Christmas Trees for 25 years and operates with one simple philosophy – to provide the best quality trees in Sussex at the best possible prices,” said Mr Wallis. The award was sponsored by JSPC. The Lifetime Achievement award, sponsored by JSPC, was awarded to David Oliver from Verisona Law. 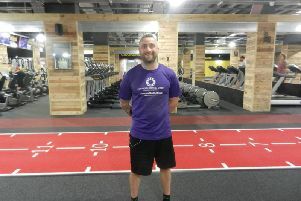 “David Oliver’s his charitable efforts speak for themselves and to set up something as important as the British Transplant Games, alongside his business commitments is extraordinary,” said Mr Wallis. The Overall Business Of The Year award, presented by Dianne Gill Events & Exhibitions Manager for Johnston Press, went to Luv Carpets. The award ceremony was followed by a disco. The night was sponsored by JSPC Computer Services, which provides ICT technical support to small businesses and schools and sells computers from its Sompting repair centre.